"It's like Skype meets the Empire State Building." I was standing at a virtual desk surrounded by 18 gigantic monitors. The simulation, which is called Dataview VR, was specifically built for people working in finance, so many of the monitors were taken up by graphs and data points that my journalist brain didn’t know how to comprehend. But I could easily see how I might be able to adapt the workstation for myself. Each virtual screen could show a website or word processor, and one — or five, realistically — could be dedicated to an endless Twitter feed. When I’d had my fill of the officescape, I unclipped the VR headset and found myself transported back to Earth — specifically the New York City office of the Glimpse Group, a virtual and augmented reality platform company that brings together entrepreneurs to develop the next generation of advanced simulations. The Glimpse Group has invested in many projects. But above all else, its leaders say, it’s working toward a collaborative workplace simulation that could one day replace physical offices and eliminate commutes. “It’s like Skype meets the Empire State Building,” said Andy Maggio, a former Morgan Stanley analyst who works as Dataview VR’s general manager and Glimpse Group’s director of finance. In Maggio’s vision, many people could share a space, collaborating on the same or different screens. One person could virtually dive into a 3D graph to analyze data while another prepared a presentation. The future sounds wild — and, admittedly, kind of industrious. The concept is certainly appealing — collaborating face-to-face with coworkers, or at least their digital avatars, who live around the world, without having to change out of your pajamas. The Glimpse Group president and CEO Lyron Bentovim told Futurism that he envisions a future in which companies invest in virtual, rather than physical, offices — like “Snow Crash” meets “Dilbert.” In this virtual world, people would blink in and out of offices or an unlimited number of conference rooms as they see fit. Rather than scheduling Skype calls or chatting over email, remote employees would be able to interact with each other and collaborate on projects as though they were all present in the same place. Different companies and services may even end up connected in a VR world of sorts, Bentovim speculated, where the physical distances between people no longer bar them from working together as well as they could in the same room. Right now, Maggio said he’s comfortable working in Dataview VR for stretches of about 90 minutes, but with improvements to the software and VR headsets, he could envision people spending an entire 40-hour work week in VR. The most distracting part for me was actually the aspect that tethered me to physical reality: the webcam feed of a computer keyboard that allowed me to actually get work done in the VR environment. Compared to the virtual aesthetics of the simulation, the video of the keyboard was jarringly out of place. In VR, your hands are represented by the two point-and-click joysticks that let you interact with your environment. But then I put the controllers down — which look like floating hands in the simulation — and saw my real arms on camera as they reached for the keyboard. It was a disorienting experience, like trying to trim the hair on the back of your head using mirrors. Bentovim said that given the choice between spending an eight-hour workday wearing a VR headset or keeping his current commute in and out of Manhattan, he would choose the latter. Bentovim suspects that VR is on the cusp of taking off, but acknowledges that it hasn’t yet. Until then, trying to replace physical offices with his simulations is, as he put it, like selling software to people who don’t have computers. As the headsets improve and companies start to adopt VR technology, Bentovim says Glimpse Group will be able to ramp the services they can offer, creating a sort of feedback loop that draws even more people into the fold. 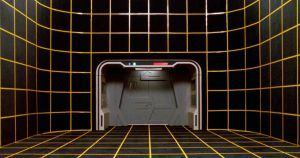 Ultimately, Bentovim hopes to move from offering specific services to creating something more universal and customizable, sort of like a real-world holodeck. But until that happens, it seems we’re all still stuck waiting for the train to drag us to work.